It's no secret that I love my Pampas (Cortaderia selloana). 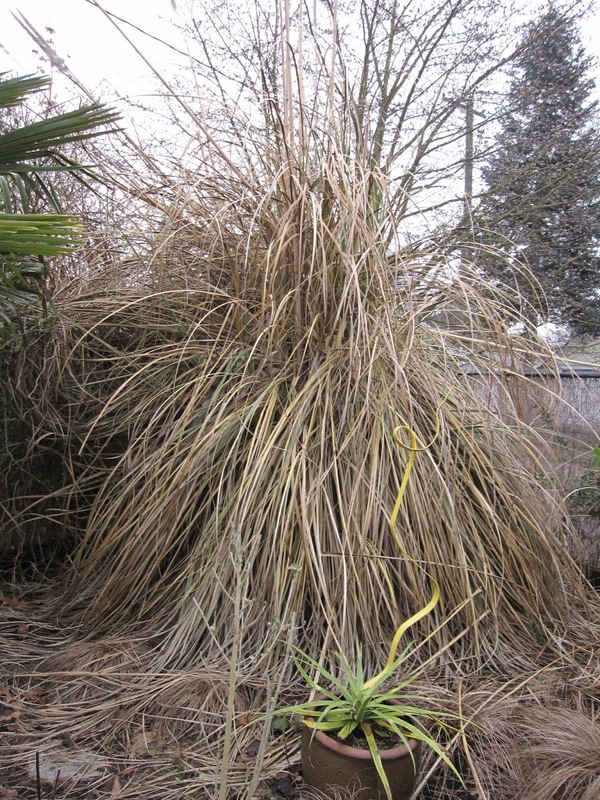 It's a big, grassy, lush, fast-grower that screens a very public corner of the back garden both summer and winter. I loved watching it gain in stature and screening power as it matured while the garden around it changed and grew. But this love is not blind, and like any long-term relationship it's also no secret that I have had some issues with it over the years. 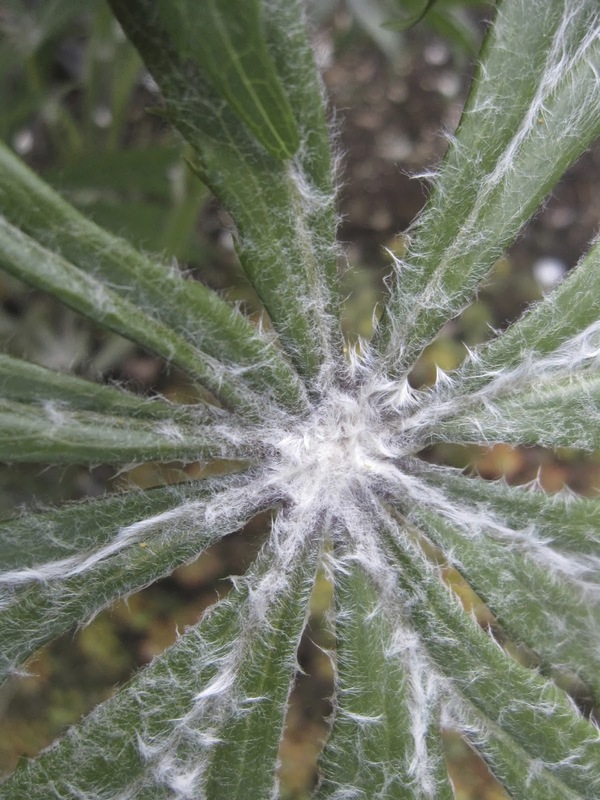 Cold-sensitivity, pinky-beige plumes (when they finally appeared) and razor-sharp leaves are a few of the things that make it a less-than-perfect garden resident. This winter our harsh weather did a number on the poor plant. While not technically dead, the whole thing yellowed to the point that it became exceedingly (and unattractively) dead-looking. It was doing nothing for our winter view, and although there were signs of recovery, it was clear it would take at least a year to really green up nicely. So just like that, I was over it. And out it came. The result is a big chunk of valuable garden real estate, and the delightful problem of what to plant in its place. The winning candidate needs to contend with the increased morning shade from the neighbor's big, hell-strip magnolia, be relatively fast-growing, provide winter and summer screening, and be able to tolerate some hot, late afternoon sun. Actually, we already have a winner, but I'll save the reveal for another post! I really thought I'd have more blooming this month. I mean, everything was budding up and looking so promising on Bloom Day in February. But now, a whole month later, I have only a few new blossoms to show you. I am grateful we're not buried under inches of snow (like some of the unfortunate Midwest bloggers still are) - read on to savor this almost-entirely-pink Bloom Day post. 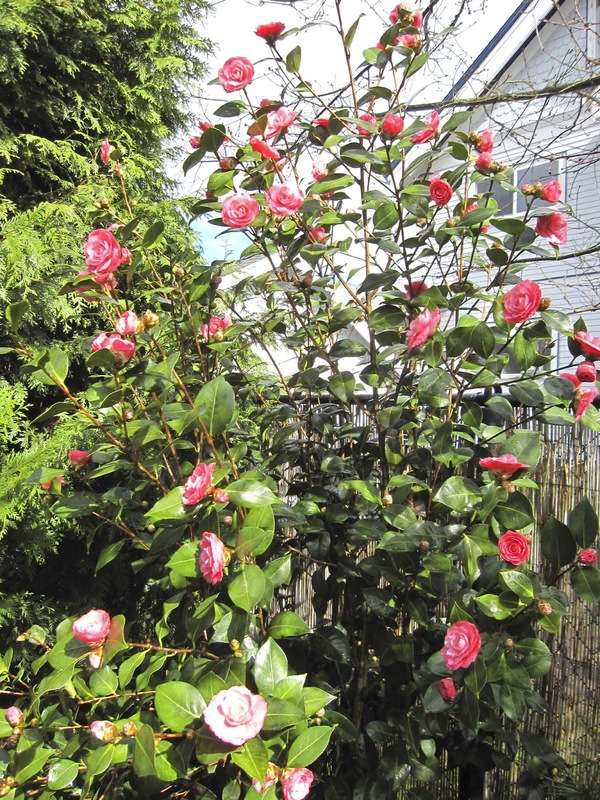 Camellia japonica 'April Kiss'. This shrub is one of many we put in to create privacy from our neighbors' driveway, and she's finally rising to the challenge and looking darn nice doing it. 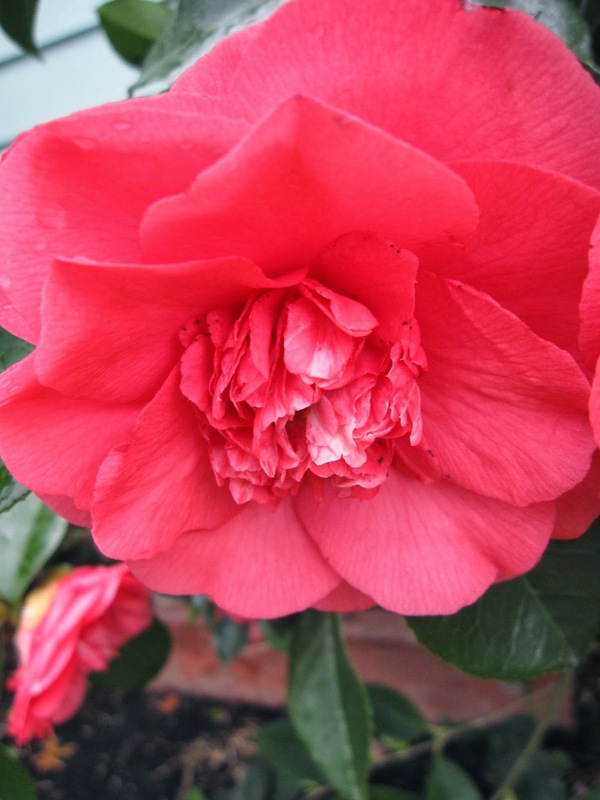 I like this Camellia because the blooms are smaller, and often perfectly symmetrically formed. In other japonica action, the heritage Camellias we got with the house are doing their reliable spring thing. There's a light pink one and a deep pink one. The Mulch Man is their staunch defender, so after pruning and caring for them all year, he gets the credit for their blooms this month. Arctostaphylos 'Austin Griffiths' looked to be on his final gasp of blooms last month, but he's come back again with a fresh flush this month. 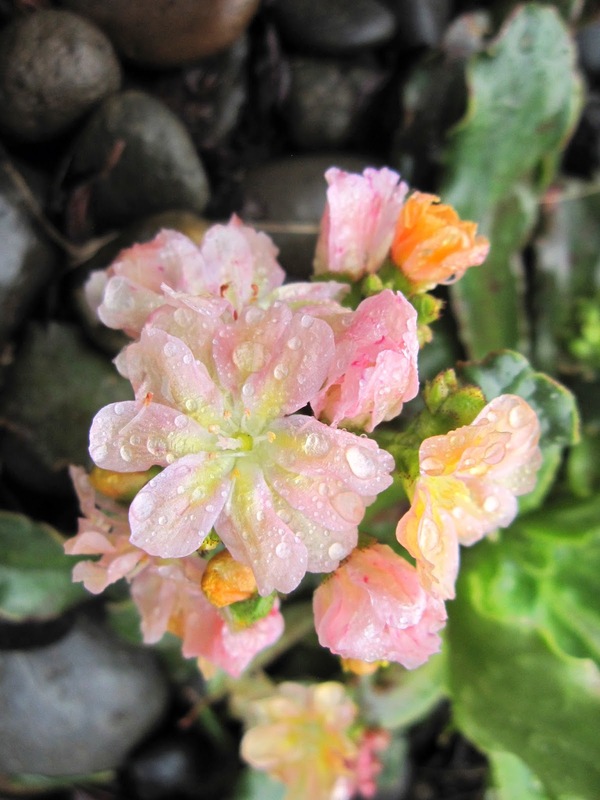 Lewisia cotyledon is just beginning to show some washed-out color. This lovely native features in my header picture and it's one of my favorite plants in the garden. My first Tulipa tarda. I love the little species tulip blooms. Daphne odora 'Marginata' is still pumping out its exquisitely scented flowers. It's rather a gawky shrub, but I'm showing it so you can see how surprisingly well it came through our two cold snaps. I expected it to lose most of its leaves, but it looks almost undamaged. Finally, my only flower today that isn't pink! Mahonia repens is finally opening. Bloom Day is graciously hosted on the 15th of each month by Carol at May Dreams Gardens. Pop on over to see what other gardeners have blooming today, and cheer on the Midwest gardeners - their spring WILL come. My favorite plant this week is a real harbinger of spring for me. Most people buy plants for their mature look. And this one's pretty cool. 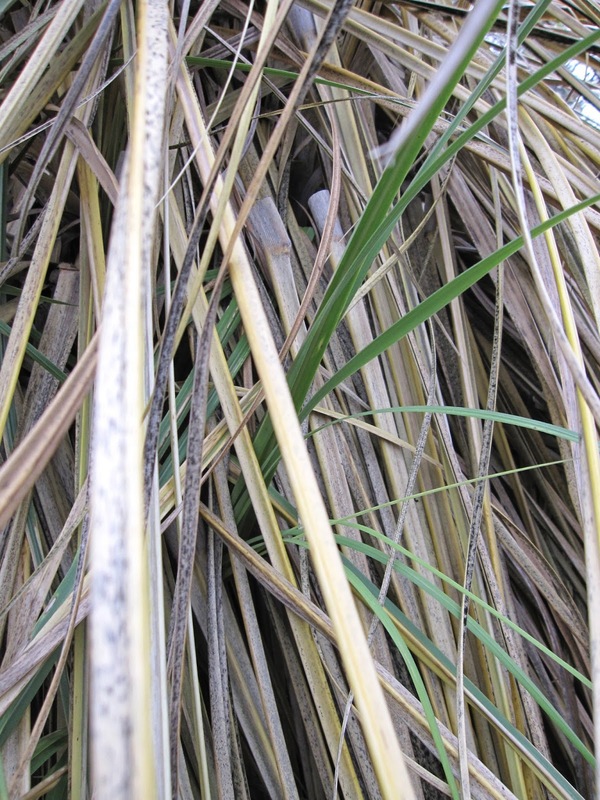 So take a look at Syneilesis x hybrida, or Shredded Umbrella Plant in this photo from last summer. But with this Syneilesis hybrid (a cross between S. aconitifolia and S. palmatum) a big part of its appeal is its bizarre leaf stalks as they emerge. The fuzzy little knobs break ground in late winter, looking soggy, but seemingly undeterred by our torrential rains. As the stalks get taller, the fuzzy, white-green umbrellas begin to unfurl. Even in high summer, the leaves on mine retain a little of the fuzzy coating that makes it look so unusual in spring. I bought my first Syneilesis from Collector's Nursery at the Lan Su spring sale in 2010. In 2011 I acquired two more, another S. x hybrida and one S. palmatum. If you look carefully, you can see the S. palmatum on the left has less residual fuzz. These fuzzy little closed umbrellas let me know that spring is on its way in a strange and lovely way. I love them now, and I look forward to their woodland charm all through summer. I can almost see the fairies seeking shelter under them on a rainy summer day. Pay a visit to danger garden and look through the comments to see what plants other gardeners are favoring in their gardens this week. It was the best of times. It was the worst of times. We went to stunningly beautiful Death Valley last month. We finished up with a night in glitzy Las Vegas. Lots of people love Las Vegas. I can now definitively report that I am not among them. Although the energy and the lights are fun, there's a little too much plastic there for my taste, and it's all surrounded by lung-defying clouds of cigarette smoke. Another strike against Las Vegas is its lack of gardens. I did a search for public gardens and came up with zero. So we went the Bellagio. It's a well-known casino and hotel with a phenomenal Dale Chihuly glass ceiling in its lobby. The Bellagio is also known for its conservatory and botanical gardens, so this being the city of bigger and better, I was looking forward to a horticultural treat. Beautiful, glowing flowers! This was promising. On we walked, into the Conservatory. 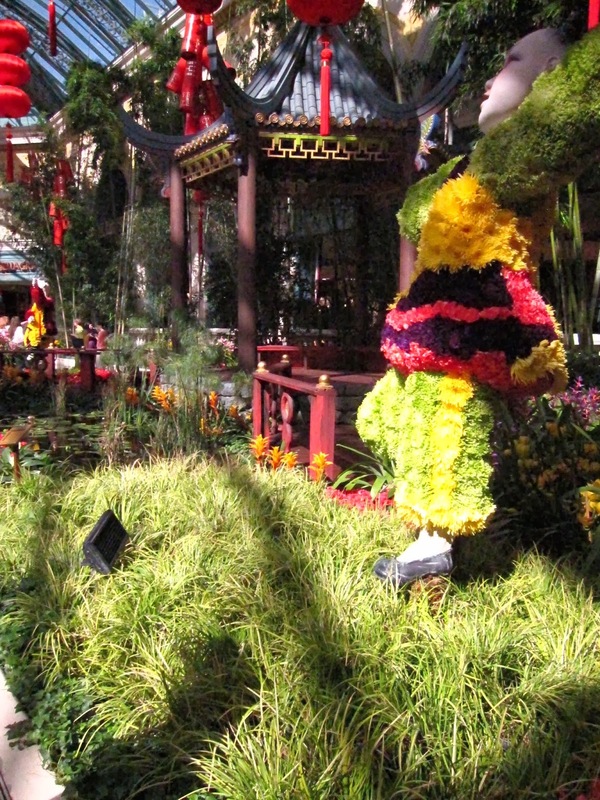 I read that the Bellagio has 120 people working on its horticultural staff, and the Conservatory display is changed five times a year. This theme was the Chinese New Year - the Year of the Horse. Acorus graminius, anyone? Color was everywhere, in an over-the-top mash-up of foliage and flowers. Bromiliads figured prominently, as did chrysanthemums. The plants appeared to be in nursery pots, rather than planted into beds. The whole effect was rather like a huge, inverted Rose Festival parade float. I did love this Mandarin orange tree full of fruit. But I gotta say, my Clivia looks better than theirs did. 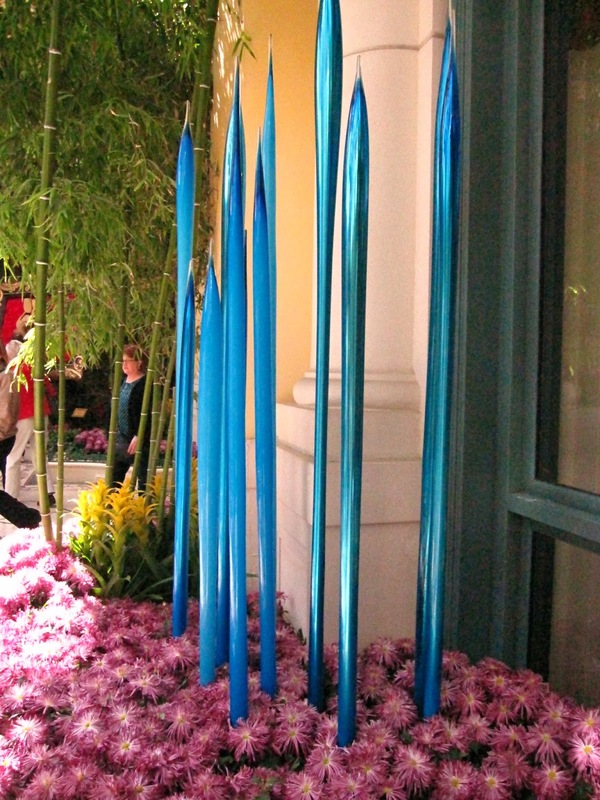 After a quick look in the Chihuly gallery and shop, we asked a staffer how to get to the botanical gardens. It turned out that the Conservatory was it - there were no more gardens. Somewhat disappointed, we high-tailed it out of that hothouse of a garden. We still had several hours left before we needed to catch our flight home, so we looked for something outdoors to do. The University of Nevada, Las Vegas was quite close so we found our way to the campus. We figured they'd at least have somewhere we could hang out and enjoy our last few hours of warm desert air. Eureka! We found the Donald H. Baepler Xeric Garden. 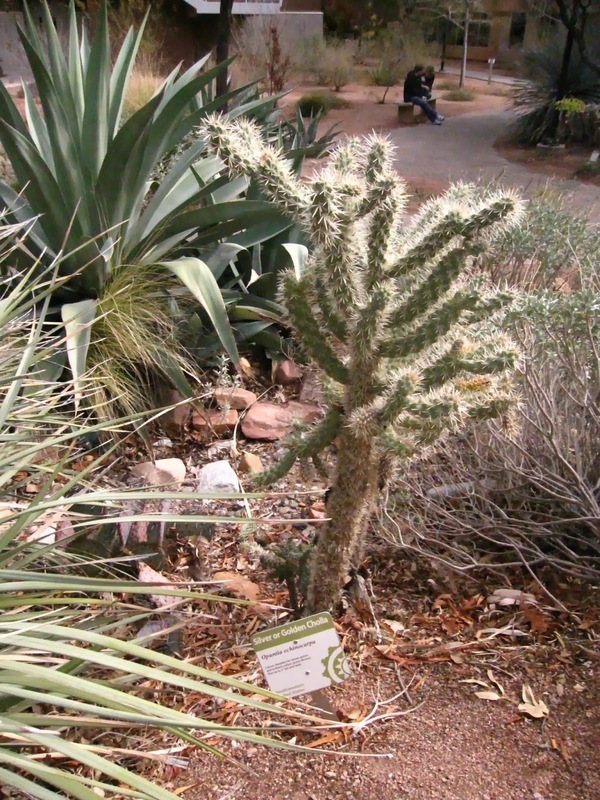 Completed in 1988, it was the the first large-scale demonstration garden of its kind in the Las Vegas Valley. The contrast of this restrained garden with the excess of the Bellagio Conservatory was exactly what we had hoped for. It had flowers, yes, but flowers in desert style. 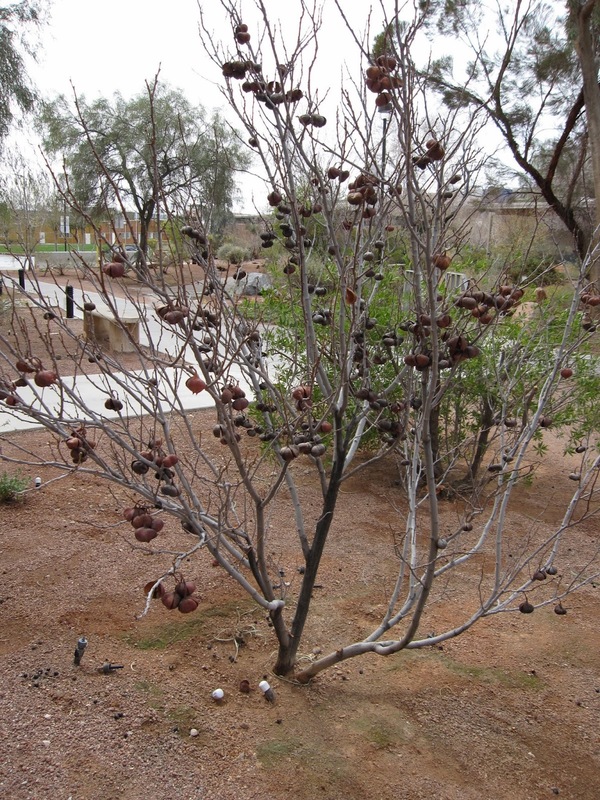 The fascinating husks left by last year's fruit added great winter interest to these unidentified shrubs. The garden winds around and between several of the campus buildings. 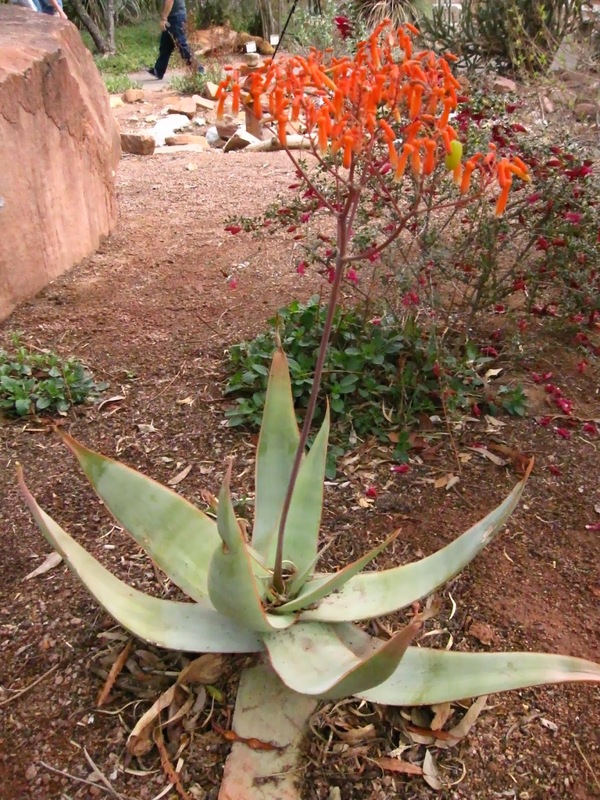 It features plants from Australia, South America, Mexico, the Mediterranean and plants native to the four desert regions of North America. 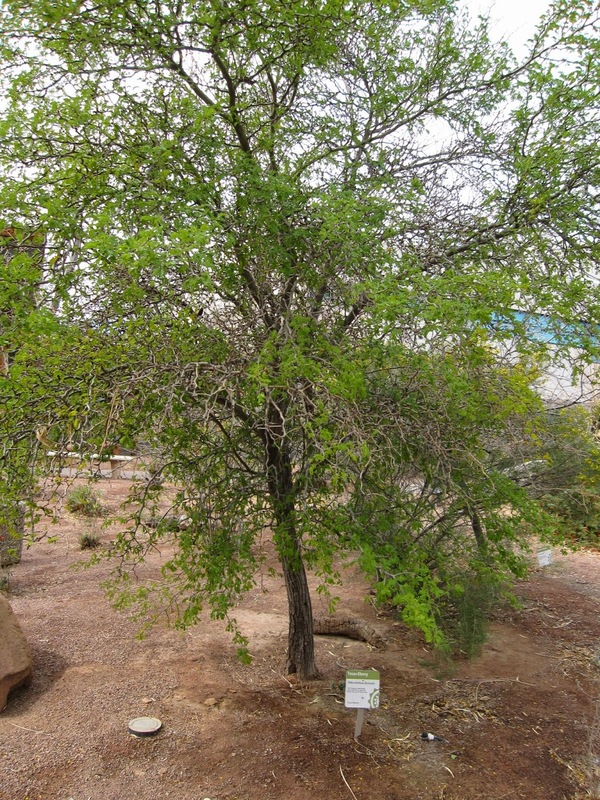 This pretty, airy tree is Texas-Ebony, Pithecellobium flexicaule. The plant ID signs were nicely done and contained the kind of information I'd want if I were a local looking to add xeric plants to my landscape. 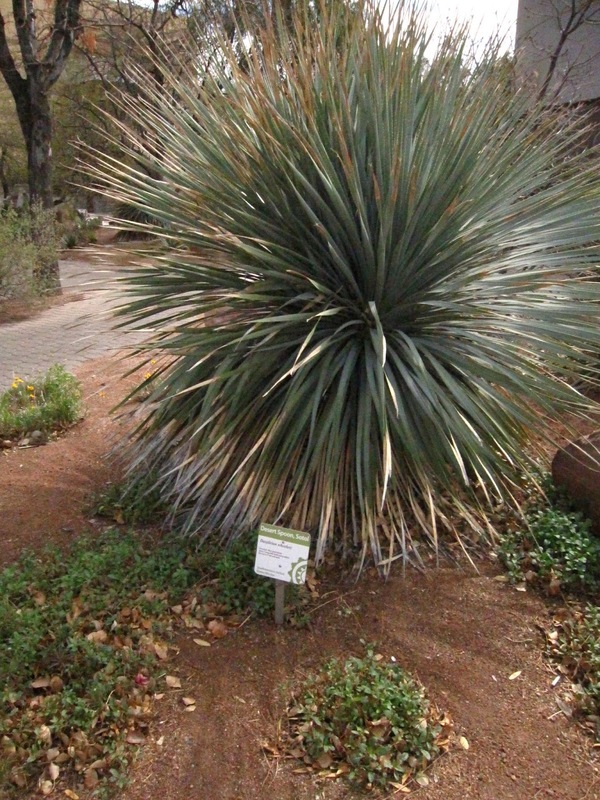 Unfortunately, fewer than half the plants were labeled, but I was able to ID a number I liked. The age of the garden meant there were many wonderful mature specimens of plants and trees. I loved the subtle interplay of shapes and muted color in the plantings. It was a satisfying garden in so many ways and a great way to end our time in Las Vegas.